Do you know of a pro-breastfeeding pediatrician in the Juhu or Andheri area? I have recently moved to Mumbai from Hyderabad and took my son to a very experienced pediatrician here who recommended clear soups to be started for my four month-old baby as he is a little underweight. I am of the opinion that solids be initiated after six months and that too in little quantities, more for taste rather than a substantial form of nutrition. I have no problem nursing and would like to nurse my second child as much as I have nursed my first born. Most pediatricians advise supplementing with formula which I do not want to do. Please help. Soup? Seriously? Your four month-old needs mama-milk, no other food or drink. You are right to wait for six months before introducing foods. Moreover, why would soup promote weight gain? Breastmilk contains quality fat, protein, and more calories than soup (unless you add sugar and fat – a burden on the digestive system that is rather pointless when you can have mama-milk). It’s custom-made for your baby! If a baby is allowed to nurse whenever he wants, he will nurse as much as he needs to and get just the right mix of protein, fat and myriad components, each and every time. How do you know he is underweight? Is he curious, active, and expressive? Is there any reason to doubt that he would nurse more if he needed more? Parents of little ones routinely face comments regarding the size of their babies. I got them constantly. For years. Why, people would ask, eyebrows drawn and shoulders tensed, is she so thin? It probably escalated people’s worry to see that I did not feed my daughter or tell her how much to eat or voice any objection if she did not eat. In fact, when we had guests over for dinner she would be so interested in talking to them that she would eat much less than usual. Everyone thought it their duty to observe, “only talking, not eating,” and follow with a can-you-top-this round of stories of the extent of coaxing, frightening, and bribing that they employed to accomplish the arduous task of feeding their own children or grandchildren. My friend Lindsay who is now a La Leche League leader in Maryland told me that when she first read The Baby Book, she thought, “I want Dr. Sears to be my doctor!” If you find that your pediatrician is ignorant about breastfeeding, you are not alone. My recommendation is not to ask medical doctors for advice on breastfeeding or on feeding in general. Aspiring physicians do not study breastfeeding in medical school, though they should at least be taught the WHO Guidelines recommending exclusive breastfeeding for six months and complementary breastfeeding for at least two years. Nor do they study food. But medical personnel, particularly pediatricians, receive a large amount of direct and indirect information and sponsorship from the packaged food industry, which uses formula as its tool to catch kids young. While there are certain conditions that necessitate formula, and doctors must learn to treat those conditions, there is no evidence to support adding formula to the diet of children absent such conditions. If you are experiencing difficulties with supply, latch, or any other aspect of breastfeeding, your nearest La Leche League Leader or lactation consultant can help you breastfeed more. Most mothers will be able to overcome difficulties and breastfeed fully; those who must use formula can still nurse as often as possible and keep up breastfeeding well past infancy and into early childhood. If you are able to lactate and your baby is able to latch on, then what you need to do, rain or shine, in sickness and in health, is nurse, nurse, nurse. Your breastmilk is the correct and nutritious food for your baby. If you substitute an inferior food such as formula, when you are fit and able to breastfeed, then even though your baby might gain weight, s/he will miss out on many nutrients as well as the special rhythms of breastfeeding that can never be imitated by formula. Breastfeeding is the key to getting acquainted with the taste of everything the family eats and so the longer you breastfeed, the smoother is the transition to family meals. There are doctors who support breastfeeding. There are doctors who study and practice health care in a holistic way and believe in the healing capacity of the body, as well as the integral relationship of the mind and body. I recently learned from a friend that her doctor, Deborah Ginsburg, supported her in giving birth naturally. If you don’t know of such a doctor near you, all is not lost. 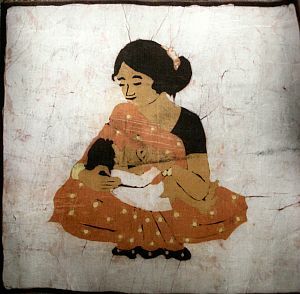 commitment to support exclusive breastfeeding for at least six months and continued breastfeeding for at least two years and beyond for as long as mother and child wish, in accordance with WHO Breastfeeding Guidelines and Infant and Young Child Feeding Guidelines as well as India’s National.Guidelines on Infant and Young Child Feeding. no advertisements in the doctor’s office or stationery. There are in fact many physicians who understand the value of breastfeeding, though we don’t hear about them often. Recently I head from a mother in Bangalore who was at the hospital nursing her three year-old daughter after a blood test. The attending physician appreciated her for doing so. Once when my daughter had a throat infection, our pediatrician prescribed medicine. When I asked her if I could wait before giving the medicine and if there were any indicators I could look for to see if it was improving through home care, she looked skeptical. I explained that I was nursing her and would check her fever regularly overnight, and would start the medicine if things worsened. But in order to feel confident, I wanted her to tell me what I should look for, apart from the fever itself. She said that if the fever remained below a certain level without the medicine, I could come back in two days and she would examine her throat again. I thanked her for her willingness to work out an alternative plan with me. I added that other doctors, in my experience, became impatient when questioned. She replied that she usually was as well, but after hearing me explain in detail what I was doing, she felt that I could handle the alternative approach. With any other patient, she continued, she would have simply insisted that they start the medicine, not trusting the patient to understand let alone follow through with anything more complex. What doctors study in medical school is illness, and therefore it is important to maintain contact with a competent doctor in the event that you or your child falls ill. The question of finding a doctors who believes in breastfeeding brings up the wider question of finding a doctor who believes in food. By food, I mean food that grows on a plant, not what comes from a plant, to borrow a phrase from Michael Pollan, who also cautioned that the food industry supplies customers to the health industry. KellyMom, How Might I Increase Baby’s Weight Gain? Pauline W. Chen, Teaching Doctors about Nutrition and Diet. I feel the same as you – that last month may be optional, but again, what is the rush? An extra month for the gut to mature seems worth the wait to me. About breast milk remaining main source of food till age 1, I believe I read it in Dr Sears The Baby Book and possibly also on the Kelly Mom site. These numbers become useful in “reassuring” people who think their babies aren’t eating enough. As long as they are breastfeeding they are getting enough nutrition. Rather than counting percentages, I would be more enthusiastic about encouraging parents to let babies eat on their own – rather than feeding, coaxing, monitoring etc. When you trust that breastfeeding takes care of the rest, then you can stop measuring how much dear child is eating. I had written to you first in October about my then four month old sonny boy who was not gaining weight due to continuous respiratory difficulties and a challenging start at birth with Meconium Aspiration Syndrome. I was advised by most paediatricians to start him on formula milk , soups, solids etc to help him gain weight. I continued to nurse him with a vengeance through all the codswallop I was hearing from everyone. And fortunately, he is fine fettle now at nine months and gaining weight decently. Super active, nursing as often as possible, eating the Baby-led-weaning way and doing well, Devaansh has grown from a sickly little baby to a bouncy infant , thriving on breast milk . Your comforting words and advice egged me on my war path and I bashed on. Just wanted to share my experience and belief in the goodness and richness of mother’s milk which not only nourishes, nurtures and sustains a baby but also protects and immunises the little one. For all those harried and worried Mammas who are striving hard to nurse and nurture their babies, take heart and do not despair. Feed you must as Mamma’s Milk is indeed the panacea for long term health. In fact, I was surprised to note that breastfeeding is almost stigmatized among urban yuppies and despite the teeming population of people and babies I did not find a single fellow mother breastfeeding publicly, absolutely anywhere. While it didn’t bother me so much to be subjected to such advice on a short trip, I do fear for other expectant moms in the family whose uncertain and unassisted attempts may be nipped in the bud by such virulent prejudice against a perfectly normal and necessary part of a child’s development. It is such a lone battle for a new mother anyway and with such misguided, sugar-coated advice and wrong branding it almost feels like a lost one.